Where to search for nice flights? The best flight finders, explained. There are plenty of websites to search for the best flight deal. I describe here some of my favourites. Do not forget to turn On the incognito mode of your browser and eventually change your IP address (you can read more about how to do it in this post). No matter the price that you find in meta search websites (Skyscanner, Momondo, etc.) I strongly recommend you to compare those fares with the ones presented in the airlines website before you decide to book the flight because sometimes you can find differences in the price. Skyscanner and Momondo are the first websites that I use to look for flights. They are good to have an idea about possible connections and prices. Skyscanner and Momondo are quite similar but I think that Momondo is a bit better than Skyscanner. In both of them you can choose options like flexible dates and check prices for a specific period, like the whole month. However, this last option does not always work at 100%. You can also find Low Costs airlines in both of them which is an advantage. Another nice thing, even if it’s quite common, is the possibility to add nearby airports and multiple destinations to your search. Another advantage of those websites is that you can get price alerts in your e-mail for a specific search you have done, this means that you will be notified in case the price goes up and/or goes down. Kayak is another common website to check but I don’t use it as often because I think that Skyscanner and Momondo can do the job pretty well. This one is for sure not as good as the ones presented above and google still has to work on it. However sometimes ITA Matrix can surprise you with nice fares, even cheaper than the websites presented above (even if rarely). Besides the possibility to add flexible dates, check prices for a specific period and add nearby airports ITA Matrix is still quite limited and the fact is that Skyscanner and Momondo can do all these as well. ITA Matrix does not consider low cost airlines which is a huge minus in my opinion, especially if you plan to fly within Europe. include luggage in the presented price, etc. Recently, a friend of mine introduced me Azair (Thanks Angela for sharing!). Well, I have been trying this website and in fact it is quite similar to Azuon. The search criteria are pretty nice and similar to the ones available in Azuon but, in my opinion, Azuon is still the best and most complete search engine for short-course flights. Nevertheless Azair is a really nice (and free!) option, even if only available for Europe, Mediterranean and Asia. Just one last thing – Keep in mind that Azair and Azuon only consider low cost airlines so always double check with Skyscanner/Momondo/etc. Well, if you like to travel and you don’t have anything specific in mind I totally recommend a few really nice websites where you can find error fares, last minute deals, etc. Fly4free is my favorite! You can also check secretflying, Budjet.Guru and Flynous. I found really nice deals in those, especially in Fly4free. Last February I found a flight from Dublin to Los Angeles for 51€. Unfortunately the bad think about most of these deals is that you have to book them as soon as you see the advertisement. Subscribing their newsletter will help a lot but still, you will have to be online and ready to book as soon as you see the deal. First come, first served! I have to mention that sometimes these flight deals are error fares of the airlines and there is a possibility that they will cancel your booking but they will give you the opportunity to have your money back or pay the difference so I think it’s still nice. Another thing about those deals is that you will have to travel probably in specific dates, you will find a lot of limitations when choosing the dates. 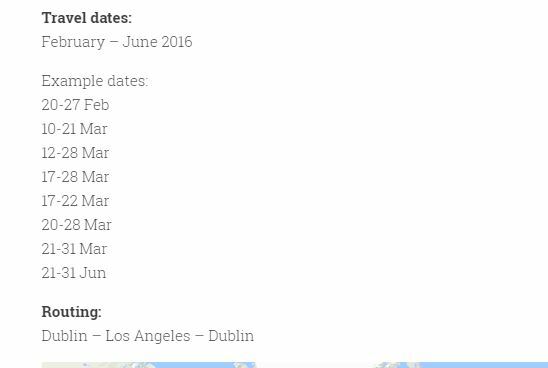 About the flight that I mentioned previously (Dublin – Los Angeles) you had a few dates to choose but still somehow limited (check below the print screen from fly4free.com). The point is – it’s possible to get a really nice fare but you will have to expect some limitations. C’est la vie! Drungli is another nice option if you don’t have a specific destination. Here you just have to introduce where you are flying from, select the dates and you will easily get a few possible options. I think that azuon is still a thousand times better but this one works fine. Last, but not the least, I recommend you to subscribe some newsletter of the airlines that you use more often. For example Ryanair often announces promotions in the newsletter. Previous Post How to get the best flight deal? 10 Do’s and Don’ts. I don’t even understand how I ended up here, but I believed this put up used to be good. Greetings! Very useful advice in this particular post! It’s the little changes which will make the largest changes. unable to subscribe to it. Is there anyone else getting identical RSS problems? great deal more, Please do keep up the great b.
more from this web page, and your views are good for new people.